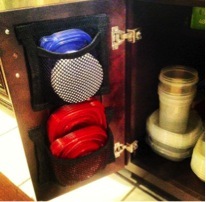 In general, kitchen organization is not rocket science. Everyone has their own way of doing it, based on preferences, but in general we have a pretty good idea of how to make our kitchen functional. But Tupperware? The Bane of every kitchen's existence. I'm pretty sure this isn't just my opinion but actual fact. 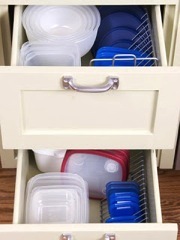 No matter how neatly you organize your Tupperware, without fail it ends up being the messiest cupboard or drawer of the kitchen. 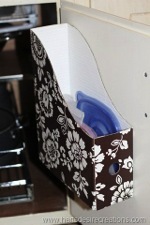 You may as well just throw it all in a drawer in the first place, because the end results are not much different. 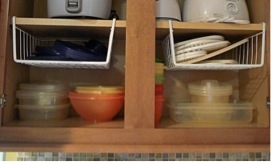 I've compiled a few ideas for different ways to organize your Tupperware so that it's not so much hassle. 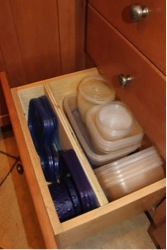 Organizing your Tupperware effectively could save you so many headaches in the future! I think it could also end up saving you some money as well- haven't we all looked at a few bites of leftovers and decided it wasn't worth keeping if it meant having to battle the Tupperware monster that lives in our cupboard? Anyway, here are some ideas I found. You could also get crafty and make your own! 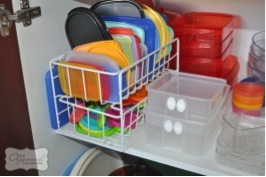 *If you don't want to stick things on the door or if you don't like the idea of having your lids tucked away, you can use a re-purposed CD rack or dish drainer to help organize your lids. 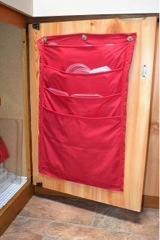 This makes them a little more accessible, but again, requires some discipline;). I don't think any of these methods are right or wrong. I think it totally depends on what space you have and your personality type. 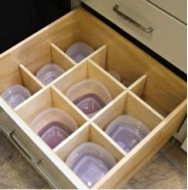 Think of the most practical place to put your Tupperware- in the cupboard by the fridge where you put your leftovers, or in a really big drawer that has tons of space for all the Tupperware in the world? Once you've decided where you are going to keep it, honestly ask yourself how disciplined you are and which of these methods will help you stay the most organized. The other thing to think about is if you have too much Tupperware. I know some people who collect EVERY container they can get their hands on. If you have the space for it, that's great. If you don't, or if you honestly don't use that much, than get rid of some. Only keep what you need. 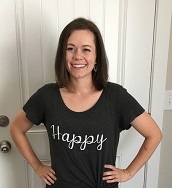 I'm sure there are many more ideas out there, and I would love to hear yours!